The 50th Anniversary committee was formed 18 months ago to begin planning an event that would celebrate this important milestone in such a way that it would be a truly memorable experience for everyone in our community. By returning to the Capri Hotel to celebrate, we feel that not only have we came home to our roots, as this is where it all began, but have highlighted how strong and intertwined the Italian community is in our city of Kelowna. It was an impressive display of camaraderie. The Mercato on Friday night showcased Italian Culture through the various merchants in our community with food, wine, fashion and automotive excellence. At the Saturday night Gala Dinner and Dance we honoured our founding/charter members; past presidents; wives of remaining founders; and our past and present Miss Kelowna Canadian Italian Club candidates. And then we partied like only Italians can, with great music and plenty of passion! As the committee chair I would like to thank my committee for their dedication, their time and their hard work to bring this event to fruition. It was a truly amazing committee to chair. I appreciate your work everyone and I’m thankful for your everlasting friendship. Di Cuore Mille Grazie. Specifically I would like to acknowledge my core committee who were with me from the beginning... Melina DiFabrizio-Moran, Patti DiMaria, Tina Vigilante, Elena Tostenson, Maria Ridgewell, Joe Iafrancesco, Janet Gagnon, and my right hand gal Jill Hotchkiss! Specifically I’d like to thank Patricia Rantucci who designed our beautiful logo and all the signage. To Coni Grande, Sabrina Notte, Jason and Rosie Agostino who organized the fashion and car shows at the Mercato. To Gord Hotchkiss who produced the founders/charter/past president presentation and looked after all the audio visual jobs for both evenings, a very big thank you since I still don’t know what wire goes where! And let’s not forget the KCIC Culinary Team (our mama’s and papa’s) who entertained everyone at the Mercato! Siete la luce che accende la via. You are the light that shows us the way..
To all the sponsors of our event, Red Tag Vacations, Okanagan Chrysler Jeep Dodge and Bella Rosa Orchards, we thank you for your generous contribution to our event. We could not have done this without your support. To all the merchants who participated in the Mercato, a thousand thank yous for showcasing your dedication to Italian cuisine. Our guests could not stop gushing about how great your presentations were. We would love to do this again with your participation! Stay tuned! And to all the businesses and individuals who contributed to the AMAZING prizes for our raffle draw, we thank you from the bottom of our hearts. We are really thankful that the 2nd prize winner was a Kelowna local since that prize weighed over 100 pounds! It was crazy! A special shout out to Pharmasave Glenmore, Brighten Their Day Gift Baskets, Bella Rosa Orchards and Peter Your Independent Grocer for your fantastic door prizes. The prize packages were pretty unbelievable and the recipients of the prizes were overwhelmed with your generosity! And finally we would like to thank the Executive Committee and all the members of the Kelowna Canadian Italian Club for their support in our event. Without you, this event would not be possible. In closing we believe the membership of our club can stand tall and be proud of our accomplishments. Fifty years as a society is a true testament to the dedication of its members and the people who have served it. For those of you who were members or kind of maybe want to be a member, we hope that this weekend event will help to convince you that we have a vibrant and dedicated community. 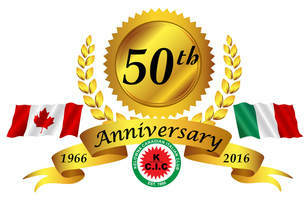 Together as a society we are strong and can endure all challenges that come our way, but at the end of the day the only reason the Kelowna Canadian Italian Club is here is to "Preserve our Culture and Heritage." Thank you all so much for celebrating with us. It was our goal to ensure that we celebrate the Club’s past, but we all wish the Club another 100 years of prosperity.